If you're thinking about packing on some size or have recently embarked on a muscle-building journey, heed these 9 simple tips from the athletes of Team Dymatize! Building muscle isn&apos;t easy, and it certainly doesn&apos;t happen by accident. If it did, you&apos;d see a lot more muscle-bound guys and gals walking the streets! Put simply, gaining quality size takes hard work in the gym and dedication to a good nutrition program—and not overnight, but over the course of a lifetime. While you can fight your way to gains all by yourself, it doesn&apos;t hurt to gather advice from fitness professionals who&apos;ve already accomplished the goals you have in mind. 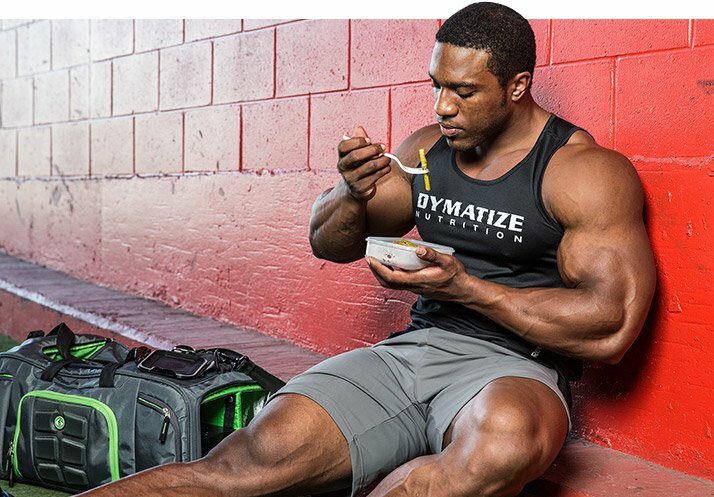 These 12 muscle-building tips from Team Dymatize will help you learn how to perform better workouts, eat healthier meals, and supplement smart to aid your goals! You have complete control over how you build your body. But, in order to utilize that control, you have to have a clear vision of the type of physique you&apos;d like to create. "I don&apos;t desire oversized muscles, but an overall athletic look," says Jennifer Dawn, IFBB bikini pro. In order to perform well on stage, Dawn has to look lean, symmetrical, and balanced. To get that symmetrical bikini look, Dawn says she adjusts the way she trains various muscle groups. "I lift heavier on certain body parts," she says, so that she can really improve her weak points. Lifting heavy weights for lower rep ranges tends to be the fastest way to yield maximum results on any area she wants to fill out. If your body is imbalanced—small legs beneath a huge upper body, for example—try Dawn&apos;s tactics and go to war on your legs with heavy, compound exercises. Utilize heavier weights and fewer reps where you need to add some size, and lift lighter reps for more reps on the body parts you want to maintain but not necessarily build. Plyometrics are a great tool for increasing speed and power—both important aspects of lifting heavy and building muscle. Plyos also increase your heart rate, so they can be a great way to incorporate cardiovascular training into your resistance workouts. Plus, plyometrics add some extra fun to your training sessions! "You will often see me in the gym combining a leg press with a stationary high jump," says Dawn. "This helps me activate all my muscle fibers in each working set I do." The combination of a controlled movement with an explosive movement also helps Dawn develop her physique alongside her performance. After all, why build muscle if you don&apos;t put it to good use? Dawn also likes to build explosive, plyo-style power into her lifts. "On leg press," she says, "I go down slowly and with control. Then I drive the weight up as explosively as possible to mimic jumps." Keep in mind that plyometric training taxes your body heavily, so include sufficient rest in your workout split whenever you add plyos as active rest or build them into supersets in your workout regimen. Building mass is not just about packing on pounds; it&apos;s about adding lean tissue, otherwise known as muscle. Cody Flynn, NPC physique competitor, has found that eating high-fiber carbs has helped him to stay lean while he builds muscle. "Choose carbohydrate sources that have a 5:1 ratio of carbs to fiber," he says. "This has kept me lean during any bulk and has worked for many of my clients." To put this advice into practice, think of it this way: If you eat 20 grams of carbs, makes sure they come with 4 grams of fiber! Jacob Wilson, who holds a PhD in exercise physiology, also believes in a carb-to-fiber ratio. For even more on this principle and why it&apos;s so effective, check out the Project Mass Nutrition Overview. In addition to killer nutrition info, you&apos;ll also find a full mass-building training plan if you need a complete program for size. If you eat 20 grams of carbs, makes sure they come with 4 grams of fiber! Building muscle is more about how you perform exercises than simply going through the motions in the gym. It&apos;s important to take every rep through a full range of motion, stretch the muscle at the bottom of each movement, and contract the muscle as hard as possible at the top. "In order to gain muscle, I focus on the squeeze," explains Jennifer Dawn. "I want blood to flow into the right area." For instance, when she&apos;s doing back extensions, Dawn squeezes her glutes hard and holds it. "It&apos;s not cute, and I even tell myself to make it look ugly!" You can use this same technique on any exercise you&apos;re performing in the gym. At the peak contraction of any lift, squeeze the working muscle hard for a moment or two, then release. Performing reps this way will help you build a stronger mind-muscle connection so you can get even more results from your workouts. In order to build muscle, you need to be able to make it through each workout with energy and stamina. "You lose important nutrients throughout your workout," explains Jennifer Dawn, "so I like to use Amino Pro, which helps me avoid muscle cramps and fatigue while I&apos;m building endurance." After her workout, she uses the post-workout supplement M.P.S. to kick-start repair and recovery. She also has an Iso-100 protein shake to give her muscles the protein they need to start rebuilding. Although she uses supplementation to assist her with her goals, Dawn knows they don&apos;t do the work for her. "Your diet should already be helping you add muscle," she says. Supplements simply lend a slight performance boost to your diet and training, which should already be on point. Nutrition for Post-Workout Recovery, Meal Replacement, or Between Meal Snacks. Go Now! Fitness model Jared Groff also believes in the power of a healthy diet. "No workout will ever beat bad nutrition," he says. "Without proper nutrition to feed your body, you can enter a catabolic state, robbing your body of size, strength, and gains." In other words, if you train like hell but starve yourself of important nutrients like protein, carbohydrates, and fat, you simply won&apos;t make the gains you desire. An easy rule of thumb when working to build muscle is to eat roughly 1 gram of protein per pound of body weight daily. Groff also believes that you can seriously damage your metabolic capacity if you aren&apos;t giving your body sufficient fuel, so don&apos;t be afraid of calories. "Think of yourself as a car," he suggests. "You wouldn&apos;t fill your tank with one gallon to drive 50 miles at 100 mph, would you?" Groff also recommends that you focus on timing your calorie intake so that your body can most effectively utilize calories. "Most people don&apos;t get enough protein each day and instead fill themselves with simple carbs that they don&apos;t use." For optimal recovery and a lean physique, Groff advises consuming lean protein like fish, chicken, and turkey. "The fewer legs, the better," he says. Groff advises consuming lean protein like fish, chicken, and turkey. If you want to focus on your health, you&apos;ll be spending a decent amount of time in the kitchen, and you&apos;ll have more muscle-building success if you master the art of meal prep. "Cooking and preparing your own meals is a sure way to know what goes into your body," says Andy Haman, IFBB pro bodybuilder. "Prepare your meals for the day, pack them with you, and you&apos;ll never be without healthy food." Haman recommends eating clean foods year round to help keep your body as lean and anabolic as possible. After all, a diet of sugar and fat will certainly help you gain weight, but not necessarily the weight you want. Remember: Quality fuel counts. Playing off Haman&apos;s advice, competitor Cassandra de la Rosa recommends eating well but striving for balance. If you&apos;re not training for a fitness competition, consider having a cheat meal every week. "Everything is about balance," she says. "Work hard all week and then have a treat on the weekend." If you want to make consistent progress toward your fitness goals, it&apos;s important to have a plan that you can stick to. If you&apos;re regimented all the time, you may find it difficult to maintain your plan for longer than a few months. Planning a weekly cheat will make that cheat satisfying, rewarding, and will help you stick to your diet. "Don&apos;t be a bodybuilder who mopes around frowning and complaining," says Andy Haman. "Those types are a dime a dozen and will never achieve or reach their goals to the fullest." Fitness should be a fun pursuit, so find workouts you enjoy and a nutrition plan that you actually look forward to. Taking even this simple step will help you enjoy building muscle for the long haul and stick to fitness for life.